A5194 is sponsored by Tim Eustace and Kevin J. Rooney. The Senate version of the bill, S3521, is sponsored by Robert M. Gordon and Steven V. Oroho. 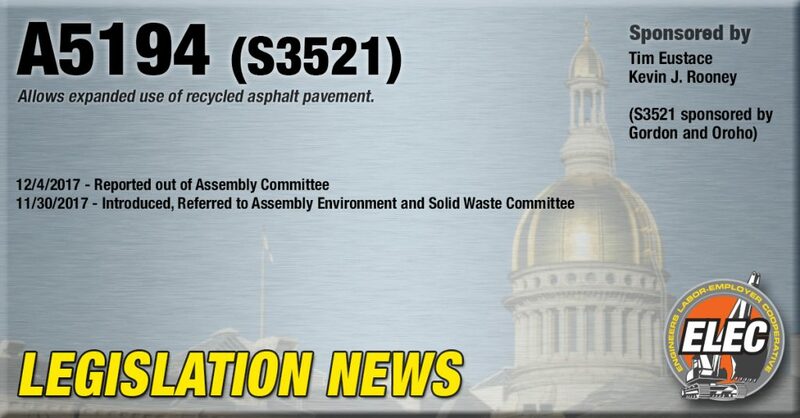 This bill would allow the expanded use of use of recycled asphalt pavement. The bill provides that recycled asphalt pavement may be used, subject to certain limitations, either (1) unbound, as a surface material for parking lots, farm roads, or pathways, in quarry reclamation, or underneath guardrails, or (2) mixed with other materials as a base or subbase material. The bill provides that unbound recycled asphalt pavement may be used as described above, provided that the user demonstrates to the Department of Environmental Protection (DEP) that the environment in which the material is used has a pH level greater than four. Also, the bill allows the use of recycled asphalt pavement in environments where the pH level is less than or equal to four if the user demonstrates to the DEP that (1) releasable levels of polycyclic aromatic hydrocarbons and metals in the material to be used are at or below drinking water quality standards established by the DEP and the United States Environmental Protection Agency (EPA), or (2) releasable levels of polycyclic aromatic hydrocarbons and metals in the material to be used are above drinking water quality standards established by the DEP and EPA, and a soil layer at a depth determined by the DEP is installed between the recycled asphalt pavement and the groundwater aquifer. The bill may be found here.